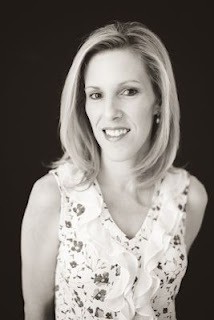 Please welcome Catherine Cerveny to The Qwillery as part of the 2016 Debut Author Challenge Interviews. The Rule of Luck was published on January 26th by Redhook. Catherine: Hi and thanks for having me. I probably started writing stories when I was around 13 or 14 years old, about the time I realized I could write down words on a page and have them form a sentence that sounded half-way interesting. I'd always loved reading, the more fantastic the story, the better. And because I loved the story and didn't want it to end, I'd wonder happened to the characters when the story was over. What were they doing next after I'd closed the book? I'd start to devise elaborate plots in my head, imagining what they might be up to and the sorts of adventures they might have. Eventually I realized I wanted to write my own stories, with my own characters, and send them on adventures rather than having someone else do it for me. Catherine: I'm a panster who forced myself to become a plotter, but who still has strong panster-like tendencies. I find that if I don't have an outline and plot exactly what I'm doing ahead of time, my story tends to get away from me. It will veer off in some direction it had no business going to in the first place. I like to know exactly where I'm going, how I'm going to get there, what's going to happen at the end, and did I bring enough snacks for the trip. This isn't to say the outline doesn't get re-written at least a dozen times, and plot-points don't have fifteen different sub-sections because I've thought of something cool along the way I want to do instead. It's just that if I don't know how it's going to end, I'm not sure how I'm going to get there. Catherine: I think the most challenging thing is realizing I can't tell the reader everything on the first page. Obviously I know the whole story, and I want to tell the reader everything that's going to happen, but I can't blurt it out all at once. It would ruin the whole story. Catherine: My list of influences is really too long to mention. It's like everything I've ever seen or read is in my head, waiting to come out in some form or another, all synthesized together into some new, amazing hybrid. I could say the Bible stories I heard as a child, to Star Wars, to the endless action movies my husband makes me see. I love reading hard science fiction, but I love reading chick-lit as well. I'm also a sucker for a good romance. 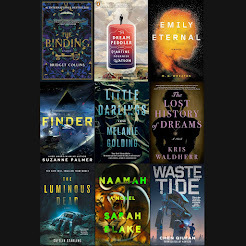 Some of my favorite writers are Kim Stanley Robinson, Hannu Rajaniemi, Sylvia Day, Christina Lauren, Jeaniene Frost, Ilona Andrews, Neil Gaiman, Sophie Kinsella, and Marian Keyes. I'm really all over the place. TQ: Describe The Rule of Luck in 140 characters or less. Catherine: A Tarot card reader living in a post-singularity world is made an offer that she can't refuse. TQ: Tell us something about The Rule of Luck that is not found in the book description. Catherine: In a world where genetic enhancements are the norm, Felicia is one of the few people alive without any genetic modifications. In some ways, it's a handicap to her. In others, she definitely knows how to use it to her advantage. TQ: What inspired you to write The Rule of Luck? What appeals to you about writing Science Fiction Romance? Catherine: I've always been interested in the idea of being able to predict the future with Tarot cards, astrological signs, prophecies, and the like. 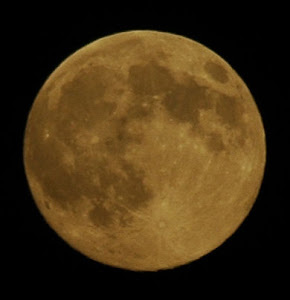 Most people believe it's a lot of nonsense and science scoffs in the face of these things. So I wanted to take a character whose entire life was based around the Tarot, mysticism, predicting the future etc. and put her in a post-singularity science fiction world with a character who was her exact opposite. One character represents a sort of spiritual, mystical side and the other represents pure science, and I wanted to see what I could do with them. As for writing Science Fiction Romance, I like the idea of pairing concepts that are traditionally science fiction while exploring personal relationships at the same time. It just makes the story more exciting and I can care more about what's happening when there's some sort of relationship at stake. I also like the idea that in the future, people will still care about each other and we won't be isolated entities, alone in our houses, all wired in, with no human contact. That' really sad to me. Plus, I can't help but like the action and adventure angle. It gives the characters something exciting to do while they're falling in love, like fight against an all-knowing government, while at the same time ratcheting up the stakes for the couple. TQ: What sort of research did you do for The Rule of Luck? Catherine: I did a lot of research into Tarot cards, and went to more psychic fairs than I care to remember. I also did a fair amount of research into genetics, planet terraforming, global disasters, space travel, what living in a post-singularity society might be like for humanity, and the Russian mafia. 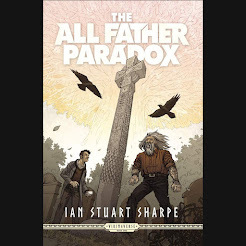 There was so much world-building that had to be done to lay the groundwork for this story, it felt like I was reading a little bit of everything. I wanted to make the world feel real and logical, and as I researched, I realized there was so much I didn't know and had to learn. Obviously, I have absolutely no idea where society will be 800 to 1000 years from now, but it was fun to guess and build it from scratch. TQ: Does Felicia Sevigny have a favorite tarot deck? Catherine: Given what I know of Felicia (and I have to say I do know her), she'd like something flashy with images as vivid and colorful as possible. Obviously her favorite deck would be the one she inherited from her great grandmother, but she'll also use whatever's available. Catherine: Felicia was probably the easiest character to write since she was basically living in my head 24/7, telling me what to do. Alexei was probably one of the more difficult ones as I kept worrying if I was going in the right direction with his character. I mean, hey, he's a criminal mastermind. I am not. I kept thinking, "What would a criminal mastermind do next? How would he behave in this situation? What's the line between being evil and redeemable?" That made it challenging. TQ: Which question about The Rule of Luck do you wish someone would ask? Ask it and answer it! Catherine: One thing I wish someone would ask is why did I decide to set part of the novel in Brazil and part in Kenya? I love to travel and those are both countries I hope to visit someday. I almost went to Brazil a few years ago but the trip was canceled at the last minute. To make up for it, I decided if I couldn't go, Felicia would. 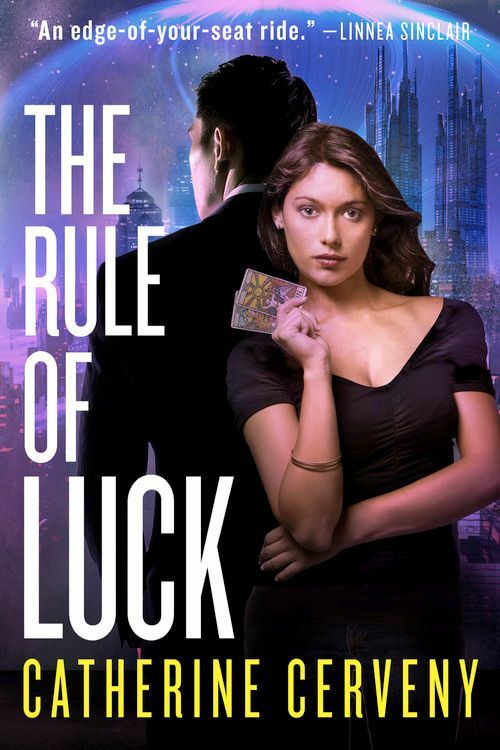 TQ: Give us one or two of your favorite non-spoilery quotes from The Rule of Luck. He was still looking at me. I mean, really looking. Looking at me the way a man did when he wondered how a woman looked naked or was considering ways to get her naked. I wondered if he was thinking about the Lovers. Or maybe I was the one thinking that. My throat went dry. I hadn't been studied like that in a long time and it felt better than it should. Catherine: Now, I'm working on The Chaos of Luck, the sequel to The Rule of Luck. It's set five months after the events in the first novel and I have to say, it's been a lot of fun to spend extra time with these characters. Catherine: No problem! This has been great. 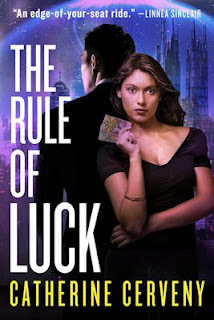 The Rule of Luck is a whirlwind thriller romance in a futuristic setting that will tug at your heartstrings while sending you on high-speed chases alongside a genetically-enhanced (and incredibly handsome...) criminal mastermind. Petriv's future looks dark and full of danger, which wouldn't be Felicia's problem, except that it's also aligned with hers. Felicia discovers she is the key pawn in Petriv's plot to overthrow the all-knowing government, and she must decide if she will trust with him with her heart, body and soul, before the future of the entire human race collapses around her.